A judgement on whether a sentence given to a teenager for killing his grandfather was "unduly lenient" has been reserved by the Court of Appeal. 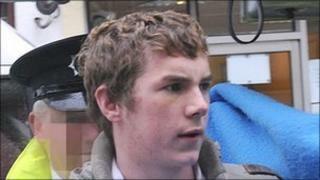 Eamonn Coyle, 18, was jailed for one year after he admitted stabbing and strangling 78-year-old Francis O'Neill. Lawyers for the Public Prosecution Service told the Court of Appeal on Friday that the jail term was unduly lenient. Coyle was 16 when he killed his grandfather during an apparent robbery. He was given a year's detention, with a further two years on licence, after he pleaded guilty to manslaughter. Coyle, formerly of Holmview Terrace in Omagh, was originally charged with murder before the prosecution accepted his plea. During sentencing the trial judge said while he was certain Coyle never intended to kill his grandfather, or even to seriously harm him, he had gone to his home "for the motive of theft or robbery". Opening the appeal on behalf of the PPS on Friday, barrister Gerry Simpson said Coyle maintained that he did not strangle his grandfather. Referring to the assessment that the teenager's plan was to steal money, the barrister pointed out how he owed rent. Mr Simpson told the court: "It is clear he was prepared to act violently towards his grandfather to get the money. "He armed himself with the knife at some stage in the course of this." Despite dispute about whether there was any intention to use the weapon, Mr Simpson argued that Coyle was holding it during a struggle with the victim. He added: "He (Coyle) either used violence in the course of it (the robbery) or he intended to cause fear. "It is quite clear he was prepared to subject his grandfather to violence in order to further his intention which was to get the money." Defence barrister John McCrudden stressed how the prosecution had always accepted the stab wounds may have been accidental. He claimed that Coyle was at the time a "highly immature" 16-year-old who would have been in a nervous state. Lord Chief Justice Sir Declan Morgan pointed to Coyle's actions immediately after the killing, which involved taking the money and going drinking with friends. The judge said: "His initial activity may suggest immaturity, but it certainly doesn't suggest any remorse. "Remorse would have been lifting the phone and getting the ambulance." Mr McCrudden argued that people drink for different reasons, adding that Coyle then broke down, returned to his grandfather's house and went "berserk" inside. He added: "This is not, in all the circumstances, a case which is unduly lenient." Judgment was reserved in the application, with Sir Declan pledging to deliver the verdict as soon as possible. Grandfather killer Eamon Coyle's term "unduly lenient"